Candied Ginger, Lemon and Poppy Seed Biscotti, with a citrus tangy scent and studded with crunchy poppy seeds. A perfect sweet and tender indulgent to be enjoyed with a cup of tea or coffee. Biscotti are absolutely hands down my favorite cookies. I am always on the look out for new flavor combinations and I must say that although this recipe is a less traditional Italian biscotti, the lemon paired with crystallized ginger work so well together. The lemon lends a nice tang while the ginger adds a lovely zing to the biscotti. These biscotti are not the rock hard variety that will necessitate a visit to the dentist with your tooth sheepishly in hand 🙂 They have a much more soft and tender bite. If you are looking for a cookie that is not over the top sweet, then this recipe is for you. Although crystallized ginger can be enjoyed on its’ own as a snack, it is simply wonderful in baked goods. When purchasing crystallized ginger, look for the soft and tender baby ginger which has a perfect balance of spiciness and sweetness and is moist and chewy. Place the butter, sugar, honey and lemon zest in a large bowl and beat together until well combined. Beat in the ginger and vanilla. Next beat in the eggs one at a time. In a medium bowl whisk together the flour, poppy seeds, baking powder and the salt. Stir the flour mixture into the butter mixture in 2 additions just until combined. Next divide the dough in half. Lightly flour your counter and roll each half into a 12 inch log. Place the logs 2 inches apart on your prepared cookie sheet. Gently press down on the logs to flatten just a little bit. Place in the preheated oven until lightly golden for 30 minutes. The top should be just firm to the touch. Place the cookie sheet on a cooling rack and let cool for 10 minutes. Transfer the logs onto a cutting board. Use a well sharpened knife to slice the logs at a diagonal into about 1/2 inch slices. Place the slices upright back onto the baking sheet and return to the oven and bake for an additional 20 minutes. Transfer the biscotti to a cooling rack and let cool completely. Glaze: In a small bowl whisk together the icing sugar, lemon zest and lemon juice. Brush the icing over the cooled biscotti and let it set for about 30 minutes. Biscotti will keep for about one week in an air tight container. 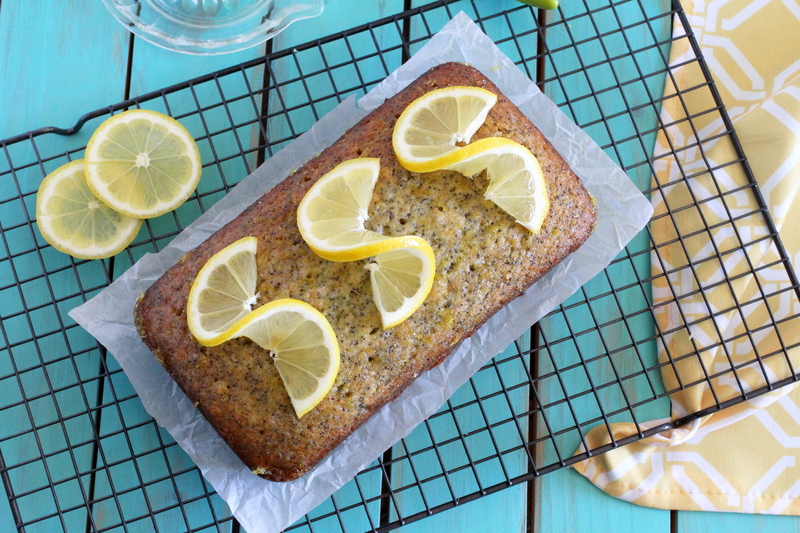 This Lemon Poppy Seed Loaf has some serious lemon kick with a tangy lemon syrup that slowly seeps into the loaf rendering it extremely moist and irresistible. It also has a delightful crunchy bite from the poppy seeds. What a tasty way of bringing a little bit of sunshine to your day with this bright and bold sweet loaf. 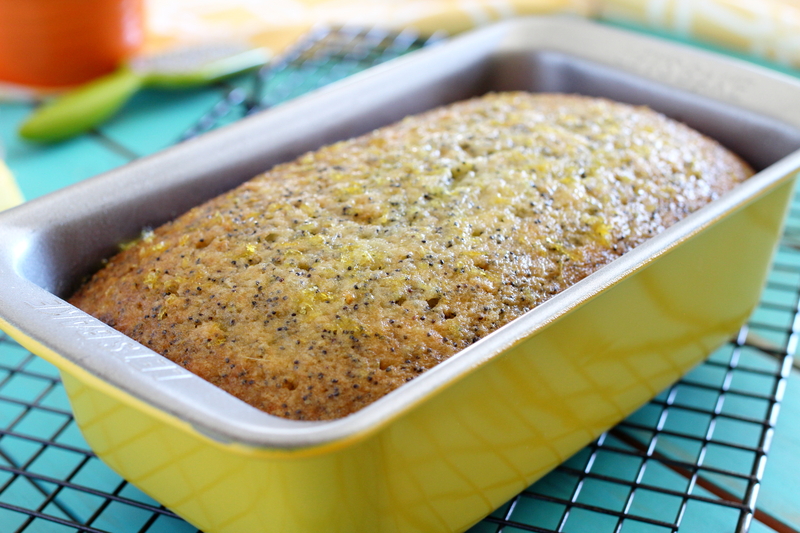 You will find this Lemon Poppy Seed Loaf to be a rather uncomplicated and pretty straight forward dessert. It doesn’t require much effort and is made with readily available ingredients. I love it for its simplicity which has also always garnered rave reviews and never fails to impress. Poppy seeds are nutty and pleasant in taste. These seeds which are obtained from the dry fruit of the poppy plant are very safe to use as food, however they go rancid very quickly. If you are not one to bake often with poppy seeds, you may want to purchase them in small quantities. Any remaining poppy seeds left over can be frozen in a freezer bag for future use. This loaf is by far, my most requested recipe and a great one to have in your repertoire. Just be sure to bring the recipe along with you if your making it for family and friends as its truly a no fail treat. Preheat oven to 325* degrees. Grease an 8 x 4 inch loaf pan. Beat together butter and sugar in a large bowl until fluffy, for about 2 minutes. Next beat in the eggs, one at a time. In a medium size bowl, stir together the flour, poppy seeds, lemon rind, baking powder and salt. Next, stir the flour mixture alternately with the milk into the butter mixture, making three additions of flour and two of milk. Pour the mixture into the prepared pan and bake in the preheated oven for about 1 hour or until a toothpick inserted in the center comes out clean. Place the pan on a rack. Lemon Syrup: Combine all the ingredients for the lemon syrup in a microwaveable bowl and heat for 1 minute, or until sugar dissolves. With a wooden skewer, poke holes all over the hot loaf, piercing all the way down to the bottom. Pour the lemon syrup evenly over the loaf and let it cool for 30 minutes. Invert the loaf onto a rack and let it cool completely.